Oral masses can be very serious or malignant, while others are much less serious, or benign. At Animal Dentistry and Oral Surgery Specialists, LLC, we diagnose first to treat optimally (correctly). This is the reason we might recommend either an incisional or excisional biopsy to first obtain the correct diagnosis, and then plan the optimal treatment. Some of the gingival enlargements previously described as fibromatous and ossifying epulides were renamed as peripheral odontogenic fibromas (POFs). 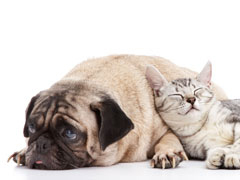 POFs are slow growing benign neoplasms that are common in dogs, and less common in cats. Biopsy is performed to have a pathologist evaluate the tissue type (to establish a histopathological diagnosis). Histopathology is necessary to definitively diagnose POFs. These tumors contain proliferative fibroblastic connective tissue, as well as proliferative ondontogenic epithelium associated with foci of a variety of hard tissues, suggesting induction. Complete surgical excision, with appropriate margins, is usually curative. We determine the ideal margins based on the location of the tumor, and the pathologist's description of the tumor at the microscopic level.